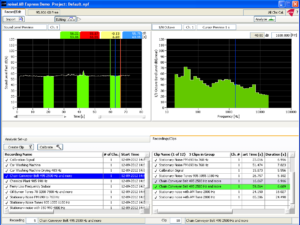 noiseLAB Pro software uses a National Instruments 4-Channel USB Digitizers or .wav files from Sound Level Meters or Hard Disk Recorders for multi-channel recording, editing, and analysis of noise and vibration signals, including sound quality, tone and impulse metrics. For classical noise analysis, 1/1 to 1/24 octave analysis is provided along with FFT spectrum analysis with resolution from 1 Hz to 100 Hz. Also included is Sound Level (Z, A, B, C weighting) with choice of integration time constant, Impulse, Peak, and statistical analysis, Leq and LE. In addition, noiseLAB also provides low frequency A weighting and Infrasound G weighting. Vibration analysis is based on accelerometer signals, which with integration provides velocity and displacement in a variety of units, displayed with linear or logarithmic X and Y scales. Both Peak, Peak to Peak, and RMS (with selectable time constant) is available for vibration analysis. The human impact of noise and vibration is a major new addition to noiseLAB. In addition to the ISO 1996 Tone Analysis, the classic sound quality metrics of harshness, roughness, loudness (stationary and time-varying), sharpness and fluctuation strength are also provided. As a leader in psychoacoustic research, the tone analysis method (ISO 1996 Annex 3) was developed by DELTA, and is now supplemented by two new experimental metrics for wind turbines: the Pedersen method for low frequencies and the LeGarth method for swish analysis By making these widely available the noise industry can contribute to test and evaluation of these techniques, and help drive suggestions for possible improvements more rapid implementation. noiseLAB provides powerful, Type 1 Recording and Analysis of noise and vibration signals and their human impact. The same analysis can also be made on imported .wav files. 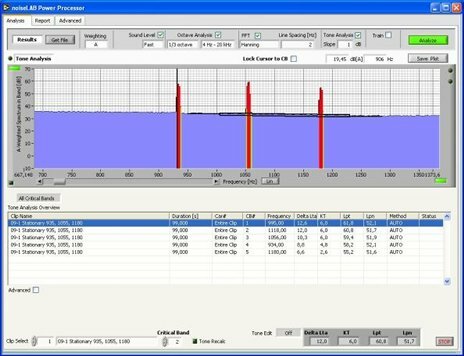 Non-destructive editing of recorded signals ensures that only relevant signals are analyzed. For a given recording the user can create multiple clips of areas of interest in the signal, and these can either be included or excluded from the analysis. Time Slice analysis, breaks the signal into shorter blocks of user-defined length. Thus the time varying aspects of the signals can readily be seen, and single-click export of multiple time slice graphs in JPG format is fully automated. All analysis data can be exported to Excel which along with exported graphs makes report generation using standard Office software tools easy. FFT spectra from external instruments can also be read by noiseLAB for subsequent Tone Analysis. noiseLAB can analyze imported .wav files and signals from a broad range of DSA digitizers from National Instruments. Time domain signals are stored in the .tdms format which is interoperable with software such as Excel, MatLab and LabVIEW. tdms, wav, tab, delimited, jpg.